The establishment of a single validated endoscopic laryngeal grading system for assessing recurrent laryngeal neuropathy (RLN) is desirable to facilitate direct comparisons between the findings of different clinical and research groups worldwide. The objective of this study was to assess the relationship between the Havemeyer endoscopic laryngeal grading system and histopathological changes consistent with RLN in the left cricoarytenoideus dorsalis (CAD) muscle of horses of different breeds with a full range of clinical severities of RLN, i.e., from normal endoscopic laryngeal function to complete laryngeal hemiplegia. Endoscopic grading of laryngeal function of 22 horses was performed using the Havemeyer endoscopic laryngeal grading system. A biopsy sample of the left CAD muscle was obtained from each horse, either at post mortem examination (n = 16), or during routine laryngoplasty surgery (n = 6). A semi-quantitative histopathological scoring system was used to grade the severity of histopathological lesions consistent with RLN in the left CAD muscle of each horse. A significant positive correlation (rs = 0.705, p < 0.001) was found between the Havemeyer grades and sub-grades of laryngeal function and the semi-quantitative assessment of histopathological lesions consistent with RLN in the left CAD muscle. However, a wide spread of muscle histopathological scores was obtained, particularly from horses with Havemeyer sub-grades II.1, III.1 and III.2. In conclusion, the Havemeyer endoscopic laryngeal grading system was found to broadly correlate with histopathological changes consistent with RLN in equine cricoarytenoideus dorsalis muscle. Unilateral partial (hemiparesis) or total (hemiplegia) paralysis of the larynx has been recognised as an important equine upper respiratory tract disease for over two centuries , and is a significant cause of poor exercise performance in affected horses [6, 7]. The most common type of equine laryngeal paralysis, i.e., recurrent laryngeal neuropathy (RLN), is caused by a distal axonopathy, predominantly affecting the left recurrent laryngeal nerve [15, 17, 3, 4, 18]. This disorder results in denervation atrophy and consequent dysfunction of the intrinsic muscles of the larynx innervated by this nerve [16, 21]. The exact prevalence of RLN is unknown, but sub-clinical RLN is widespread in horses, with one study showing endoscopic laryngeal asynchrony in 64% of 427 Thoroughbred yearlings at a sale . Brakenhoff et al. . found 42% of Belgian draught horses to have clinically significant laryngeal endoscopic changes. Furthermore, studies using histopathological criteria to evaluate the presence of RLN showed 30%  to 80%  of apparently normal horses to have histopathological laryngeal muscle changes indicative of denervation atrophy. Resting laryngeal endoscopy is currently the most commonly used method for diagnosing and assessing RLN in equine practice [9, 13, 25] and is largely based on the degree of abduction obtained and maintained by the suspect arytenoid cartilages. Research on RLN has been hampered by the lack of agreement on the endoscopic grading of laryngeal function, which has made direct comparisons between the findings of different clinical and research groups difficult. The three most commonly used laryngeal endoscopic grading systems are the 4-grade scheme [12, 24], the 5-grade scheme  and the 6-grade scheme . Of the above three systems, the 4-grade system  is currently the most widely used. The introduction of the Havemeyer endoscopic laryngeal grading system in 2003 represented a consensus agreement from prominent equine clinicians and researchers worldwide . The grading system was based on an amalgamation of the above-noted, three grading systems. However, the Havemeyer endoscopic laryngeal grading system has not as yet been objectively validated, nor has it achieved universal acceptance. The purpose of this study was to examine the correlation between the various Havemeyer grades and sub-grades of laryngeal function, and the degree of histopathological changes consistent with RLN present in the left cricoarytenoideus dorsalis (CAD) muscle of horses with the full range of clinical severities, i.e., from normal endoscopic laryngeal function to complete laryngeal hemiplegia. The study was performed using appropriate Home Office project and personal licences. Signed owner consent was obtained prior to inclusion of each horse in the study. Because of the noted, widespread prevalence of sub-clinical RLN, and also of unrecognised clinical RLN in the general equine population, samples were obtained from 16 randomly selected horses that were euthanised electively as a result of various clinical disorders not related to the respiratory tract. No evaluation of upper respiratory tract function at exercise was performed in these 16 horses. Samples were also collected during routine laryngoplasty surgery (n = 6) from horses with severe clinical RLN. The 22 horses had a median age of seven years (range 1-29 years) and comprised 11 Thoroughbreds, six Thoroughbred crosses, three Warmbloods, one Friesian and one pony (Table 1). Twenty-four hours prior to sample collection, resting laryngeal video-endoscopy (Olympus CF Type 200 HL) was performed (without sedation and with head collar restraint only) to assess the symmetry, synchrony and range of arytenoid movements during quiet breathing, following at least three swallows and during temporary occlusion of the external nares. The video-recorded laryngeal movements for all horses were reviewed and independently graded using the Havemeyer endoscopic laryngeal grading system (Table 2) by two assessors, Padraic Dixon and Niamh Collins. TB = Thoroughbred; TBx = Thoroughbred cross; FR = Friesian; WB = Warmblood; P.M. = post-mortem examination; CAD = cricoarytenoideus dorsalis. All arytenoid cartilage movements are synchronous and symmetrical. Full arytenoid cartilage abduction can be achieved and maintained. Arytenoid cartilage movements are asynchronous and/or larynx is asymmetrical at times, but full arytenoid cartilage abduction can be achieved and maintained. 1: Transient asynchrony, flutter or delayed movements seen. 2: There is asymmetry of the rima glottidis much of the time due to reduced mobility of the affected arytenoid and vocal fold, but there are occasions, typically after swallowing or nasal occlusion, when full symmetrical abduction is achieved and maintained. Arytenoid cartilage movements are asynchronous and/or asymmetric. Full arytenoid cartilage abduction cannot be achieved and maintained. 1: There is asymmetry of the rima glottidis much of the time due to reduced mobility of the arytenoid and vocal fold, but there are occasions, typically after swallowing or nasal occlusion, when full symmetrical abduction is achieved, but not maintained. 2: Obvious arytenoid abductor deficit and arytenoid asymmetry. Full abduction is never achieved. 3: Marked, but not total arytenoid abductor deficit and asymmetry with little arytenoid movement. Full abduction is never achieved. Complete immobility of the arytenoid cartilage and vocal fold. Sharply dissected samples (circa 1 cm × 1 cm in cross section) of the lateral belly of the left CAD muscle were obtained either within an hour of euthanasia or at surgery (circa 0.5 cm × 0.5 cm in cross section). Samples were immediately frozen in isopentane cooled in liquid nitrogen and then stored at -80°C in plastic universal containers until processing. Serial sections (12 μm thick) of all muscle samples were made in transverse planes using a cryostat microtome maintained at -20°C. Sections were stained with haematoxylin and eosin, oil red O, modified Gomori's trichrome and myosin adenosine triphosphatase at pH 9.4 . Muscle sections from each horse were coded and independently assessed blinded by two assessors, Niamh Collins and Elspeth Milne, using light microscopy, for evidence of secondary histopathological changes consistent with RLN. The semi-quantitative histopathological grading system used was adapted from that of Duncan et al.. The following histopathological parameters were subjectively scored from one (absent), two (focal distribution), three (multifocal distribution) to four (diffusely affected): single fibre atrophy, small group atrophy, large group atrophy, hypertrophy, nuclear clumps, fibre type grouping and fat and/or fibrous replacement of muscle fibres. The myopathy histological score was calculated for each assessor for each left CAD muscle by summing the individual scores for each of these seven histopathological parameters. For the correlation of endoscopic and histopathological changes, the pairs of observations from the two independent assessors for Havemeyer grade and sub-grade of laryngeal function, and the pairs of observations from the two independent assessors for myopathy histological score, were ranked and tested with a Wilcoxon's signed rank test. The correlation between the ranked Havemeyer grades and sub-grades of laryngeal function, and the ranked myopathy histological score of the 22 horses was tested using a Spearman's rank correlation test. For all tests, a probability of < 0.05 was considered statistically significant. All statistical analyses were carried out using the R Project for Statistical Computing http://www.r-project.org. The independently-assessed, resting Havemeyer grades and sub-grades allocated to left laryngeal function of the horses by both assessors did not significantly differ (P = 0.999). The assessors agreed on the major grading (grades I to IV) for all 22 horses, but disagreed on the sub-grade of laryngeal function in four of the 22 horses. Two of these disagreements concerned the classification of horses as sub-grades III.1 or III.2, and two on the classification of horses as sub-grades II.1 or II.2. The video-recorded laryngeal movements of these four horses were again reviewed by both assessors and a consensus agreement was reached on their sub-grades of laryngeal function that were used in the subsequent correlation analysis. Endoscopically: three of the 22 horses were classified as grade I; seven as grade II (including four sub-grades II.1 and three sub-grades II.2); 10 as grade III (including five sub-grade III.1, three as sub-grade III.2, and two as subgrade III.3); and, two as grade IV (Table 1). The paired myopathy histological scores allocated to the left CAD muscle by both assessors did not significantly differ (p = 0.835). The mean of both assessors' values was taken as the left CAD myopathy histological score (Table 1); and was used in the subsequent correlation analyses. The results of the 22 horses showed a wide range (8-24.5) of left CAD myopathy histological scores. Despite three horse having totally normal endoscopic findings (grade I), no left CAD muscles were considered to be normal. Mildly affected muscles (horses 1-5, 8-11, 13, 14) showed mild fibre size variation (single fibre atrophy, small group atrophy and hypertrophy) with a focal or multifocal distribution; focal fibre type grouping was also apparent in some of the mildly affected muscles (horses 2, 9, 11). Moderately affected muscles (horses 6, 7, 12, 15, 18) showed more marked fibre size variation (single fibre atrophy, small group atrophy and/or large group atrophy) with a focal or multifocal distribution: multifocal fibre type grouping was present in all of these horses. Severely affected muscles (horses 16, 17, 19-22) demonstrated all seven histopathological parameters (including fibre type grouping) with a multifocal or diffuse distribution of these lesions. 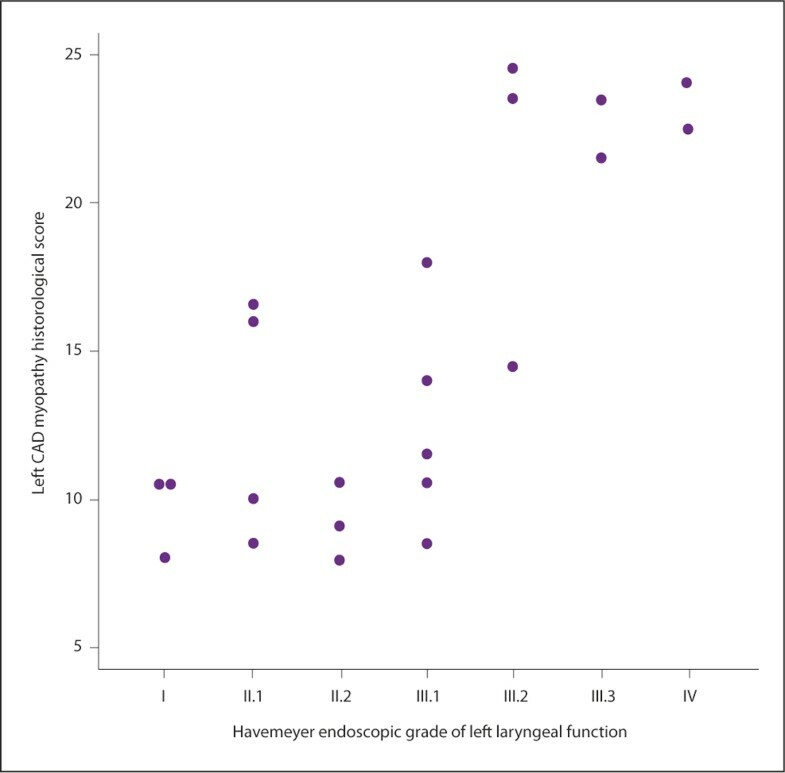 A statistically significant positive correlation was found between the Havemeyer grades and sub-grades of laryngeal function, and the left CAD myopathy histological score (rs = 0.705, p < 0.001) (Figure 1). Muscles from horses with grades I and II.2 laryngeal function showed mild neurogenic change (myopathy histological scores 8-10.5) and horses with grades III.3 and IV laryngeal function showed severe neurogenic changes (myopathy histological scores 21.5-24). However, a wider range of myopathy histological scores was found for grades II.1 (8.5-16.5); III.1 (8.5-18) and III.2 (14.5-24.5) (Table 1). Modified scatterplot comparing the left CAD myopathy histological score and the Havemeyer endoscopic grade of left laryngeal function of the horses in the study. The values of two horses (Horse 1 and Horse 2) with grade I laryngeal function and left CAD myopathy histological scores of 10.5 have been graphically altered to make both visible. CAD = cricoarytenoideus dorsalis muscle. A well-defined, universally adopted resting endoscopic laryngeal grading system is desirable to allow consistency in communication between clinicians concerning RLN cases, and to aid in the determination of the requirement of further diagnostic procedures such as high-speed treadmill endoscopy. It would also facilitate more accurate comparison between RLN findings from different clinical and research groups. it must correlate with laryngeal function during exercise. The Havemeyer endoscopic laryngeal grading system appeared to be simple, practical and clinically applicable, as the major grades and sub-grades could be readily applied to all 22 horses in the present study. The endoscopic results were consistent between the assessors, with no statistically significant difference found between the grades and sub-grades independently allocated to laryngeal function by both assessors. In the 16 horses where muscle samples were obtained at post mortem examination (Table 1), neither the performance history nor the possible existence of abnormal respiratory noises at exercise were investigated, and the grading of laryngeal function was based solely on the result of a single resting endoscopic examination. Performing resting endoscopic examinations in isolation has limitations, which have been described previously . Interestingly, in these 16 horses, which were mainly euthanised for intractable musculoskeletal problems, a wide range of laryngeal function was evident (grade I-III.2), including six (38%) horses with grade III laryngeal function, confirming the widespread presence of sub-clinical, and unrecognised RLN in the general equine population. Only one previous study  has attempted to correlate resting Havemeyer grades with performance at exercise. In that study of 461 horses, all 201 horses with grade I laryngeal function and 96% of 117 horses with grade II laryngeal function had normal arytenoid abduction during high-speed treadmill endoscopy. Eighty per cent of 126 horses with grade III laryngeal function had some degree of arytenoid and/or vocal cord collapse at exercise, and all 17 horses with grade IV laryngeal function had laryngeal collapse at exercise. Ducharme's study unfortunately did not individually evaluate the various Havemeyer sub-grades. Further studies correlating the resting Havemeyer grades and sub-grades with laryngeal function at exercise are required to assess the accuracy with which the resting Havemeyer grades and sub-grades can be used as a predictor of laryngeal function during strenuous exercise. The Havemeyer endoscopic laryngeal grading system was found to broadly correlate with the left CAD myopathy histological score (rs = 0.705; p < 0.001). Conversely, none of the other grading systems in current use [the 4-point grading scheme [12, 24], the 5-point grading scheme  or the 6-point grading scheme  have been similarly investigated. However, a wide range of myopathy histological scores was found in horses with Havemeyer sub-grades II.1, III.1 and III.2 (Table 1). There are some possible explanations for this finding. One possible explanation is that while endoscopic examinations performed at rest can easily identify horses with normal laryngeal function (grade I) and relatively severe laryngeal hemiparesis and hemiplegia (grades III.3 and IV), resting endoscopy may not be a sufficiently sensitive diagnostic technique to detect lesser degrees of RLN which are identifiable on histopathological examination, that may have minimal functional consequences. Another possibility is that while the histopathological grading system employed in the present study was designed to identify horses with histopathological changes consistent with recurrent laryngeal neuropathy, re-innervation of muscle fibres (as evidenced by fibre type grouping) was also present in 64% (14/22) of the 22 left CAD muscles. Fibre type grouping has been previously described as a prominent histochemical feature of RLN [22, 23, 15, 16, 19, 5] and may restore sufficient abductor function to allow continued arytenoid movement, despite the presence of denervation atrophy. It is also possible that some neuromuscular lesions may be unequally distributed, and that multiple sites of the left CAD muscles should have been assessed. In conclusion, the Havemeyer endoscopic laryngeal grading system was found to be a simple, practical and clinically applicable system, and little inter-observer variation occurred when used by trained individuals in this group of horses. It was found to broadly correlate with histopathological changes consistent with RLN in the left CAD muscle. Further studies evaluating the repeatability of the Havemeyer endoscopic laryngeal grading system in a larger number of horses and correlating the resting Havemeyer grades and sub-grades with laryngeal function at exercise could further support the adoption of the Havemeyer endoscopic laryngeal grading system as the standard endoscopic laryngeal grading system in horses. This study was supported by funding from the Horserace Betting Levy Board. We thank Dr Darren J Shaw for assistance with the statistical analysis and data presentation and Neil MacIntyre for invaluable laboratory assistance.